How are your doing on your March Madness Brackets? I bet you are watching a lot of Basketball these days or at least checking the scores each morning. You might even be snacking a little more during all this March Madness time. Nothing beats a big bowl of homemade guacamole but you need to find perfectly ripe avocados or have good menu planning and purchase them a few days in advance. This is not ideal when you have a spontaneous March Madness party, this is when Wholly Guacamole products come in handy and are the perfect addition to any snack table. This post about March madness Snacks was made possible with the free products provided to me from Wholly Guacamole. All the opinions expressed are 100% my own. Wholly Guacamole comes in many varieties there is a flavor to please all of your basketball fans, both young and old. Don’t serve ordinary March Madness Snacks, mix things up by serving Guacamole with pretzels instead of higher fat tortilla chips. Pretzels not only get the same crunch and saltiness but there is less chance you will get bits of chips in your guacamole. Nothing worse than dipping into a big bowl of Taco dip to find someone’s chip on your serving. Wholly Guacamole is a favorite at our home because you can easily freeze the containers out and pull out for a spontaneous march madness party or simply for taco night. My son also has started taking guacamole and pretzels along with him to school. It makes a great snack or even topping for a sandwich roll up. Will you be making any special March Madness snacks this year? 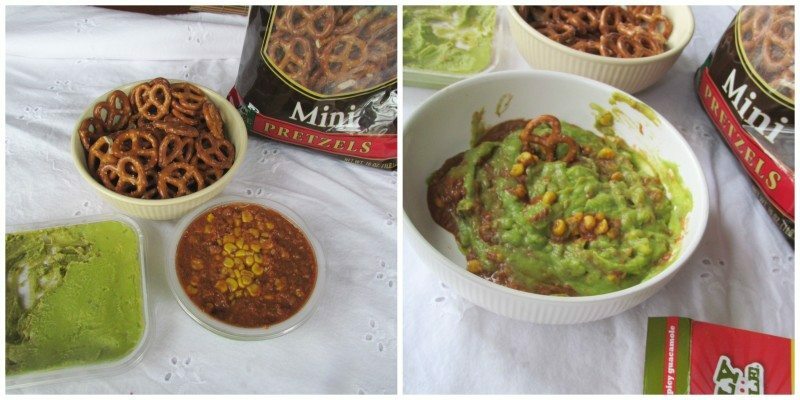 Why not serve up some guacamole and pretzel. Close to Home and Wholly Guacamole will make it easy for you with this Giveaway. The layered dip was good cold but we liked it heated slightly in the microwave too. This way you were able to mix all the flavors so you would get the guacamole as well as the bean and corn on each pretzel. This was a little spicy for the kids but my husband and I enjoyed it. Good Luck and enter the Rafflecopter below. well, honestly I’m most excited about the guacamole because my daughter are a big fan of the stuff! however, I’d love to try the salsa, too – I’ve never tried it! i’m excited about trying the Cooler of various Wholly Guacamole and Wholly Salsa products. I’m excited about the Guacamole Layered Dip. I would love the taco bean dip sounds really great. Love to cook with Wholly products they all look delicious ! I like all the Wholly products, my fav is the guac. I love the guacamole and would love to try the layered dip. I would like to try the taco dip. I tried the ranch guac recently and am much more a classic fan.